Harvey, a Live Rabbit Appears: The helper is thrilled and amazed! Plus, Harvey stays around after the show for everyone to pet. Clean Comedy: using age-appropriate comedy that creates ripples of laughter. Funny Puppetry: “Sherlock Bones” will do his own silly magic trick. Goofy Costumes and Funny Hats: Children love to “dress up”. Audience Participation: The show includes over a dozen children as helpers. Your Guests Are the STARS of the Christmas Magic Show! 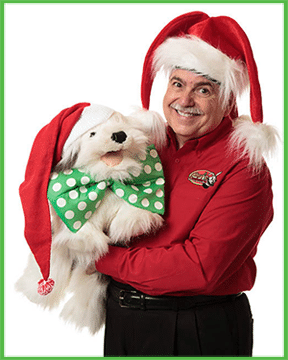 The Christmas Magic Show blends comedy, magic, a puppet, audience helpers, dress-ups and music into a unique, one-of-a-kind, Holiday family program. And, all of the routines have Christmas and winter themes with snowmen, snow, candy canes, Rudolph, Christmas trees, Santa Claus and much more. Watch in amazement as snow is magically created and turned into snowballs and a snow cone! Smiles are plentiful when Mrs. Claus asks Santa to wear something different on his annual Christmas Eve run. The children’s jaws drop in wonder and excitement as ornaments and a Christmas Tree are magically created from nowhere. And laugh hysterically as Sherlock Bones, the World’s Smartest Dog sniffs out and resolves a Christmas Magic Show mystery. Many photo ops when 7 helpers dress as elves to help Santa and his Reindeer complete their mission. Harvey, a live rabbit, magically appears at the end of the show. Everyone gets to pet Harvey after the Christmas Magic Show. The Christmas Magic Show is 45-minutes long. Audience helpers have fun and no one is embarrassed. Lots of amazing magic, audience participation, holiday dress ups, hats and silly fun throughout the show. Clean, tasteful comedy shows for all ages. Laughter fills the room and the praise goes to you for a job well done! There is no work for you to do and nothing for you to worry about. You just provide the place and audience. I bring my own tables and sound system. Also, there is no special staging needed. You just pay me the day of the show. So, no deposit or advance payment requirements. Finally, accepted forms of payment are cash, check and credit/debit cards. Not all magic shows are the same! And you probably only coordinate Christmas events once a year. So, to ensure you get the best possible entertainer, use this FREE Magic Show Comparison Worksheet. 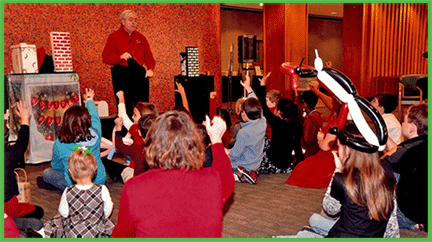 Most of all, these 12 questions can guide you in selecting a Christmas Magic Show that will meet your needs. 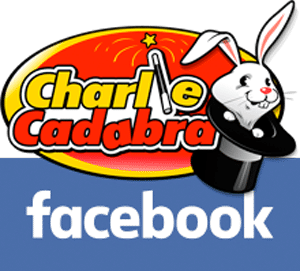 Charlie Cadabra is available to perform at your event throughout the Greater Cincinnati Area – including Mason, West Chester, Hamilton, Middletown, Harrison, Florence, Northern Kentucky and more. 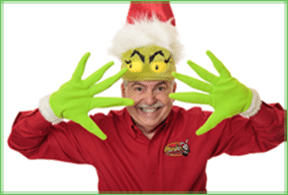 Because you may have some questions about booking a Christmas magic show, these Magic Show FAQs will help answer them. Birthdays only come once a year and you want your child’s special day to be memorable. So, your child is the star in Charlie Cadabra’s Birthday Magic Show! In addition, the birthday child helps to magically produce Harvey, a live rabbit. And, everyone gets to pet Harvey after the show. 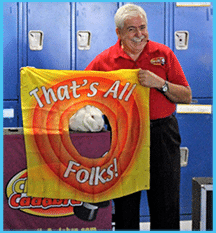 Charlie creates a new fun magic show every year for Early Learning Centers, Daycare Centers, Preschools, and Summer Camps. The Magic Show for Children includes age-appropriate routines, silly fun, and tons of audience participation. And, the magician, Charlie Cadabra has different magic shows based on the age range of the children (pre-school age, school age and both together). As well as, Charlie’s silly fun, non-scary Halloween Magic Show. The show is perfect for daycares, family events, block parties, and church events. So, only non-scary, silly, versions of Ghosts, Witches, Pumpkins, Frankenstein, Zombies, and Dracula are included in the Halloween magic show. Charlie Cadabra is available to perform at your event throughout the Cincinnati metropolitan area, including Northern Kentucky. 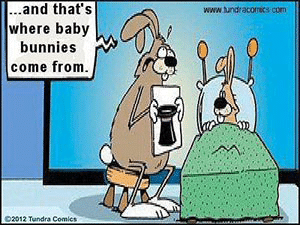 Where do bunnies come from? 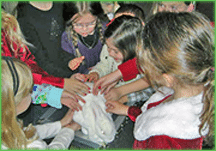 Harvey, the Magical Rabbit, appears in Charlie Cadabra's magic shows. Harvey stays around after the show for the guests to pet him!